The inspiration for these came from some my mom made fo r my older sister when she had twins a couple years back. It was my favorite, so I decided to try making some. They're easy to mass-produce (especially if you can get past being a perfectionist...it's taken me a while) and there have been very few baby showers I've been to where someone else gave burp clothes. These are also SUPER nose wipers for toddlers. In fact, I like them even better as nose wipers than as burp cloths. I've tried a couple things for baby shower gifts over the years. I used to get a onesie and cross-stitch something personalized onto it for the mom. Then when we brought Firecracker home, I realized that wasn't such a great gift. For me...I like to give gifts that I feel will be really useful, and even though the onesie was personalized and handmade, it was only one onesie amongst hundreds the recipient would have and use. These have become my "standard" baby gift for just about everyone I need a gift for. (...so if you're going to a baby shower I'll be at...this is my gift. :) They can be personalized by choosing a specific print. You can use just about any soft fabric. I've used knits and terry cloth, but flannel is my favorite. I try to pick up remnants when I can or wait until it goes on sale. Jo-Anns often has it on sale for around $2 right after Thanksgiving. 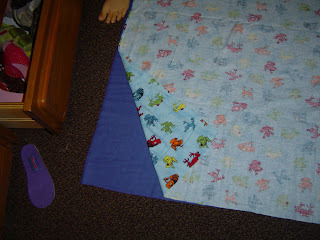 Materials: Soft Fabric (Flannel, knit, or terry cloth), thread (matching or not), sewing machine, scissors or rotary cutter. 1. Choose your fabric. I like to have two different fabrics that coordinate, but the same kind works too. 2. Lay the fabric out right sides together. This way it's all set to pin once you cut it. 3. 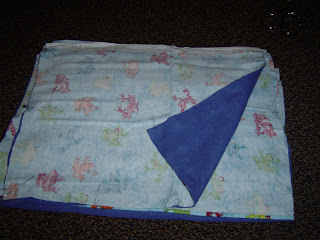 Cut the fabric into the size you want the burp clothes. You don't need to measure this. (Tell your inner perfectionist to go away.) 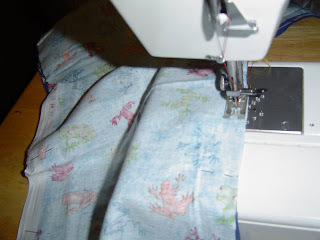 Approximations are fine and if your lines aren't perfectly straight, they'll even out when you sew them. 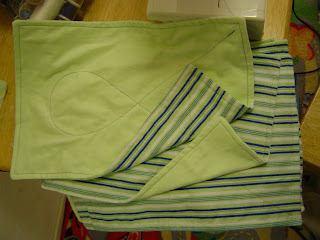 Remember the finished burp cloths will be just a tad smaller, since the seam allowance will be inside. 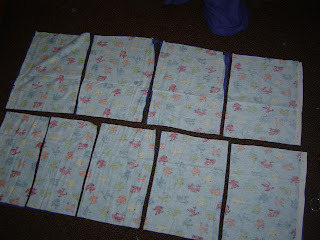 I probably only should have cut four in that first row...but you know...they're just burp cloths. It's okay. So probably best to get 4 burp cloths out of 45 inch wide fabric. 4. Pin them together a bit, so they don't shift while you're sewing them. Firecracker (4 1/2 years) liked helping with the pins, so I gave her one to pin while I did the others. 6. 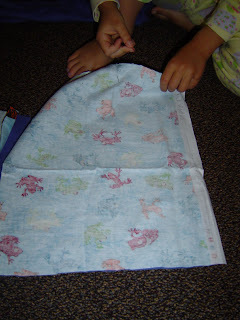 Sew along the edges with a 1/4 inch seam allowance. Start in the middle of one of the longer sides, and stop several inches shy of that when you come around the other side. You need an opening, so you can turn it inside out. The color thread here really doesn't matter much because it won't show. 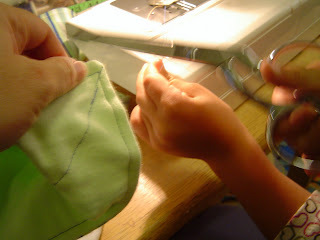 I let Boy "help" with some of the sewing by getting to touch the fabric below where my hand was. He could feel it slip through his fingers without getting the fingers close to the needle. 7. Trim the corners. You might also trim the sides if some of the seam allowances ended up being wider because of a salvaged edge that wasn't printed on. 8. Turn burp clothes right side out, making special effort to push the corners out as far as possible. 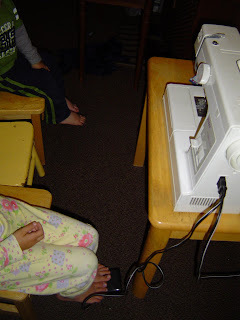 If you haven't been able to put your inner perfectionist away, this is also where you would iron them nicely and use a pin to pull the corners and sides out right to the seam. I used to do this, but on this particular morning I was racing against the clock and skipped it. It saved a lot of time and the end product was still quite nice. I don't think I'll be ironing these again. So at this point, wrong sides are together and the sides are all sewn together except the opening used to turn it right side out. 9. 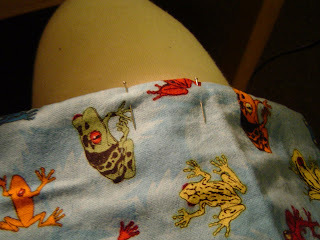 The only part I worry about pinning is the opening to make sure the seam allowances stay inside. 10. 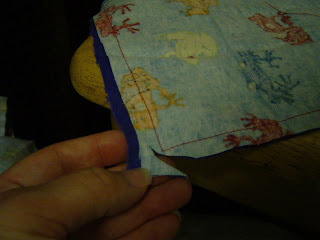 Then I start in one of the corners and stitch about 1/4 inch in around all four sides, making sure that I catch the seam allowances on the part that is between the two pins. 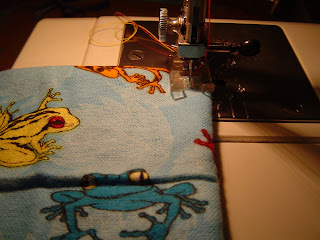 This stitching is decorative and also helps make sure the burp cloth keeps its shape. 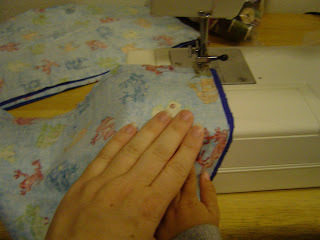 At each corner, I make the turn by keeping the needle in the fabric while I lift the pressure foot up. Wow! That looks amazingly easy and super cute. I'm definitely gonna have to remember this the next time I'm invited to a baby shower! Definitely checking out JoAnns after Thanksgiving this year - love the frog print!